The World Championship will feature 16 of the game's most accomplished players – 14 from the inaugural circuit of pro competition, including the Injustice 2 Championship Series, as well as two from the Last Chance Qualifier (Saturday, Oct. 21 at Noon on Twitch) – competing for $250,000 in prize money. Live TBS coverage will continue Friday, Nov. 3, at 10 p.m. with Group B, followed by the Championships at the same time on Friday, Nov. 10. Live gameplay coverage for both Group A (Oct. 27) and Group B (Nov. 3) will begin at 6 p.m. on Twitch, which will also offer live streaming coverage of the entire tournament. ELEAGUE will present a rotation of fighting game experts and former pro players to cast each match and break down all the live action from ELEAGUE Arena. 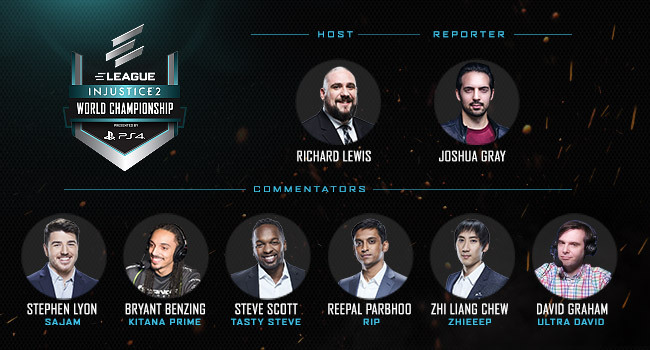 Richard Lewis will return as studio host, joined by ELEAGUE newcomers Joshua Gray (reporter), Bryant “Kitana Prime” Benzing (commentator) and David "Ultra David" Graham (commentator). ELEAGUE will also bring back popular casters Stephen "Sajam" Lyon, Steve "Tasty Steve" Scott, Reepal "Rip" Parbhoo and Zhi "Zhieeep" Liang Chew from the ELEAGUE Street Fighter V Invitational.